Disney Princess Royal Dreams Castle or Barbie Rainbow Cove Princess Castle $39.87 (Reg. $99) + Free Shipping! Start your Chrstmas shopping! What a steal! 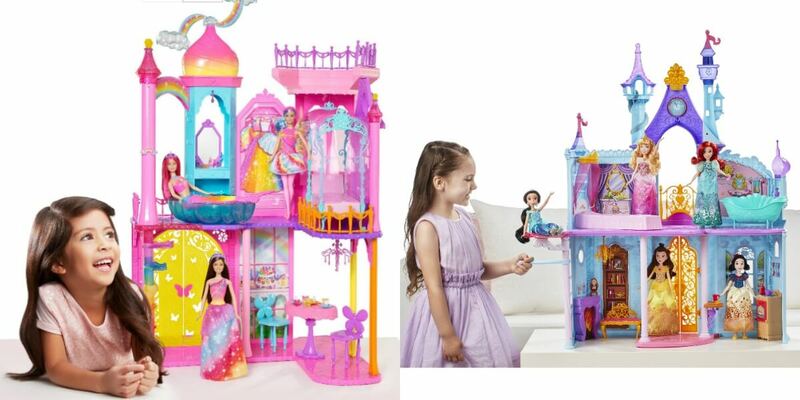 Get the Disney Princess Royal Dreams Castle or Barbie Rainbow Cove Princess Castle $39.87 (Reg. $99) + Free Shipping! from Walmart! At the top, sparkly clouds can hold a fairy doll as she spins and overlooks the entire cove (dolls sold separately). Double doors are decorated with rainbow hues and cutout butterflies. A dining room on the first floor has room for a table you can set for two with cupcakes, tea and themed chairs for princesses, mermaids and fairies from the kingdom. Rainbow-colored stairs lead to the second floor with a vanity, closet and bedroom. A gorgeous canopied bed has a purple pillow perfect for sweet dreams and vanity accessories like a brush and perfume bottle to add to the fun! A shell-shaped mermaid pool creates outdoor space below, while a rooftop deck is a fabulous spot for tea! Tell all kinds of fairytales with this brightly colored rainbow castle — the possibilities for happily ever afters are endless! 4 FREE General Mills Cereals at Stop & Shop!